Fantastic album destined to become a fan favorite. If you’re one of the skeptics wondering what was to become of Dream Theater in the post-Portnoy years, fear not. On the aptly self-titled album, Dream Theater, the band reminds everyone why they are the most beloved band in the prog metal genre. This is an album true to their name, and one that deftly combines heavy metal with progressive rock and classic hard rock. It’s full of orchestral movements, extraordinary musicianship, loads of rich melodies and powerful rock content. It paints a picture; it tells a story. We knew that bringing Mike Mangini into the band lineup was going to really take things to another place once he became part of the songwriting process—the drum parts for A Dramatic Turn of Events were already written when he joined the band in 2011. Sure enough, the drumming here is sure to dazzle and impress. There’s plenty of double-kick work to keep metalheads pumping their fists, but it’s all the other grace and groove that Mangini brings that creates a subtle shift in the vibe of the music and takes it to places slightly new. John Petrucci’s guitar work is stellar as usual, as is the keyboard work of Jordan Rudess and the bass work of John Myung. There are plenty of subtly different guitar tones on display here for the tone obsessed (yes, it’s all still obviously Mesa tone), and Rudess’ chops are dazzling as ever, and share space with some great orchestra performances in the album opening and closing tracks. Myung is on fire. Not only did he contribute lyrics to a song (die hards look for this little detail), but you’ll hear him soloing (along with other bandmates) on the instrumental track, “Enigma Machine.” Yes, you heard it, sports fans. It’s the return of the instrumental, and it rips, complete with dueling soloing lines like only this band can deliver. And what of our dear friend, James LaBrie? Fantastic job with the vocals here. I think the work he’s done on his two recent solo albums (check out his fantastic new release, Impermanent Resonance) has influenced his vocal contributions here, as he’s sounding really melodic, sometimes with a big rock voice, as well as delivering some nice intimate moments set against acoustic guitar backdrops. Favorites would have to include the memorable, “Along for the Ride,” with a vocal hook that will stick in your head like a classic ‘70s rock song (not to mention the vocals are followed by a very Keith Emerson-like synth solo). Enough of my babbling. There just isn’t any weak spot on Dream Theater. We love this release. This is Dream Theater sounding better than ever. If you were a rabid fan of the band circa Images & Words, Awake, and Falling into Infinity, you’ll find this album to be more of a return to form, but combined with their updated, modern metal edge. And once again, we’re thrilled that overly aggressive mastering didn’t kill this release like far too many metal genre records today. A Geoff Tate solo album for sure, but don’t confuse this with actual Queensryche music. What we have here is Frequency Unknown featuring the Tate-fronted Queensryche. I went into this with an open mind and was even rooting for Tate to return to form and prove his former band mates (and critics) wrong. I mean, who can blame him for wanting to get out there first with some new music and establish his version of the band as the genuine article? Not to mention, the artists who provide guest appearances on this release read like a dream team: everyone from KK Downing (Judas Priest), Ty Tabor (Kings X) and Brad Gillis (Night Ranger), just to name a few. Unfortunately, Tate’s master plan fails to include the most important element: good songs. Since 1994’s Promised Land album, Queensryche releases have been lackluster and uneven at best, with perhaps one or two good tracks per album and the remainder of tracks sounding like some artsy-fartsy musical experiment gone awry. For almost two decades I suffered through this as a good sport, but 2011’s Dedicated To Chaos was so bad that I handed in my fan card. Frequency Unknown is even less of a Queensryche album than Dedicated To Chaos was, and it carries on the tradition of one or two passable songs, at best. There is only one common denominator here and that’s Tate. I think it is safe to say we now know who was holding the band back all these years. The album starts off pleasant enough with the semi-decent, “Cold.” However, two things quickly become apparent: the mix and overall fidelity is horrid, as is Tate’s voice. This is by far his worst performance on record to date. In fact, at the start of the song “Give It To You” he actually warbles off pitch! This particular song is also a candidate for the worst lyrics in a Queensryche song ever. The repeated “How You Like Me So Far?” begs the response, “Not so much, Geoff.” Tate performs most of the album’s vocals in a strange, “breathy” style and oftentimes sounds strained and hoarse. To add insult to injury, his vocals are often obscured by the poor mix, no doubt a nasty byproduct (or blessing perhaps) of Tate’s drive to rush-release this album. The one lone exception is the song “In The Hands Of God,” which could have been included on Promised Land and serves as the album’s best song. Even Tate sounds good on it, and actually manages to emote a bit. Sadly, that is where the excitement ends. Tracks such as “Life Without You” and “Dare” are flat out boring, as is “Running Backwards”—a track that proves Tate can’t even fake a catchy chorus. The final track, the obligatory ballad “The Weight Of The World,” closes out this snooze-fest as an act of mercy. But wait, there’s more! The album also includes four re-recorded Queensryche classics, which is completely inexplicable and pointless. Anyone who has seen the YouTube videos of Tate’s hired hands butchering these classics already knows what to expect. Not only do they not serve to better the originals, they are at times embarrassingly bad, especially Tate himself, who sounds off pitch and strained to the max. “Empire” and “I Don’t Believe In Love” are particularly dreadful and border on cringe worthy. If you’re going to remix, at least learn how to use Auto-Tune properly. I really wanted to like this album, but it is quite simply a hot mess and certainly not worthy of the Queensryche name. Anyone expecting a return to form needs to ignore this album and pick up the real, self-titled Queensryche release. Tate would be much better served moving forward as the artist named Geoff Tate. This would make everyone feel better about his new musical direction, and we might not hold it to the same high standards we set for the band Queensryche. That band, this is not. Mature offering for long-time fans. When I hear the name Jimmy Eat World I automatically begin to hear the catchy chorus of their popular song, “The Middle,” in my head, and I flash back to the days when I would see the music video for said song play on MTV (the days when MTV actually played music videos). Now grown from those days, Jimmy Eat World shows their maturity on the new album, “Damage.” Described in an interview with Rolling Stone as an “adult break-up record,” the album shows honesty and growth while dealing with the topic of lost love. This well-rounded album definitely shows how the band has evolved, while still featuring the familiar sound fans love. The album is mainly made up of energetic pop rock that is consistent with the sound of Jimmy Eat World, albeit without the emo edge of their earlier work. It also has a healthy mix of down-tempo songs. “You Were Good” in particular is an intimate and heartfelt acoustic song, and provides a nice wrap-up to the album. It’s a good change from the upbeat tone of the album and really illustrates how the band has matured. Of course, there are songs like “I Will Steal You Back” and “How’d You Have Me” that are the upbeat, radio-friendly songs that longtime fans will immediately connect with. There’s no denying that Jimmy Eat World knows how to make and play good music, though there’s nothing about the performances here that stands out one way or the other. And even though the overall topic of the album is about broken relationships, it’s not so heavy that it makes you want to curl up in the fetal position and cry for three days, like a good classic from The Cure. The album definitely offers a mature take on breaking up—the reflection and the questioning, but also a hint of acceptance. Overall, it’s some good, easy listening, and enjoyable pop rock. If you call yourself a guitar player, it’s fantastic pleasure reading. Noted guitar book author Dave Hunter strikes again with a book you simply must purchase for any serious guitar player in your life. 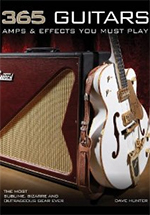 365 Guitars, Amps & Effects You Must Play is a compact book filled with beautiful color photos and brief write-ups on a fantastic variety of “classic” guitars, amps, and effects that may be of interest to guitarists across all genres. Ever wondered about the allure of a BOSS SD-1 or 1963 Fender Twin Reverb? Classic gear, as well as a few modern boutique items, is on display, and for the most part, Hunter has assembled a pretty nice collection. He covers the classic Marshall amps, Fender and Gibson guitars, and a huge assortment of everything in between (both electric and acoustic). We were impressed to see he made a point to include the Parker Fly and Roland Jazz Chorus JC-120, and doubly impressed to see some modern gear from the likes of Fryette, Strymon, and Breedlove. But then we also found ourselves cursing at the poor guy for missing some obvious classic pieces of gear. How’d you miss the TC Electronic 2290 and 1210, Dave? Sure, we can debate the included gear for days on end, but this was a fantastic stab at the topic, and 365 Guitars makes the perfect bedside companion or bathroom reader. Just take it in a few pages at a time, and put away your checkbook. Genesis lives on thanks to prodigal son. We’ve been big fans of Simon Collins for a few years now. Son of legendary Genesis drummer/vocalist, Phil Collins, the younger Collins has forged a solo career track as a songwriter, drummer, and vocalist as well. To hear him sing, the family lineage is obvious, as you would easily mistake him for his dad circa 1980. You could almost say the same for his exceptional percussion work—he probably had a pretty special teacher/influence/role model. Sound of Contact is a new band effort, led by Simon Collins, but not entire about Collins. And unlike his recent solo albums, this one is classic, melodic prog rock that will appeal to fans of early Genesis, Yes, and Pink Floyd. The first two tracks on Dimensionaut are instrumentals of the classic prog order (i.e. not prog metal), but with modern sounding guitars and synth textures. The vocal songs are filled with beautiful harmonies, and combining those vocals with acoustic guitar rhythms conjures up the feeling of classic Moody Blues and ELO blended with the more aggressive prog rock playing of the bands mentioned earlier. The overall vibe is mid-tempo prog rock, and the first single, “Not Coming Down,” paints a nice picture for the rest of the album. Dimensionaut was mostly conceived of, and produced by, Collins along with keyboardist Dave Kernzer, a name familiar to fans of modern day prog rock as he’s worked with a who’s who of well-known artists in the genre (not to mention his work on Collins’s great solo album, U-Catastrophe. Matt Dorsey and Kelly Nordstrom supplied fantastic layers of electric and acoustic guitars and bass (and vocals) for the album, though the touring lineup features some new players including Porcupine Tree sideman, John Wesley. The album is full of beautiful music, and it’s one of those rare listening albums that is thoroughly enjoyable to listen to in one sitting, where the music really takes you away to a new place. Fantastic mixing and mastering ensures that the music sounds the way you’d expect of a meticulously crafted album. With a vocal delivery that is so much like the perfect blend of Phil Collins and Peter Gabriel, and wrapping up the album with a delicious, twenty-minute prog epic, “Mobius Slip,” you can easily forget just who you’re listening to. But that’s ok with us, because like the elder statesman, the next generation is already writing tomorrow’s classics today. THIS is the real, new Queensryche album. Goeff Tate’s Frequency Unknown failed to inspire me, and truth be told, I went into this listening session with a bit of fear and trepidation. Fact is, I despise classic bands that replace iconic singers with a “sound-alike,” so I was expecting a collection of songs that are nothing more than a shameless attempt to impersonate their own works from a bygone era. What I got instead is the classic Queensryche sound with a modern edge, and although new singer Todd La Torre can indeed sound like a dead-ringer for Tate at times, he brings his own stylistic approach as well. In other words, this is the Queensryche album we have been waiting for since 1994’s Promised Land. The album starts off with a short instrumental of sorts, the Scott Rockenfield penned “X2,” then leads into the first proper song, “Where Dreams Go To Die,” and it’s instantly obvious that all parties involved here have a clear understanding of what Queensryche should sound like. The twin guitars are back, as is Scott Rockenfield’s distinct drumming and Eddie Jackson’s bass (key elements that have been missing since forever). When La Torre sings for the first time you’ll have to remind yourself repeatedly that you are not listening to Tate circa 1985. This particular track speaks of karma and revenge and leaves little to the imagination in regards to who the subject is. “Spore” is a great example of how a modern version of this band should sound—the opening riff sounds unlike anything else in the band’s catalog, yet it is distinctly Queensryche in its delivery, delightfully heavy and “Proggy.” Yes I said it, the Progressive element is back in a big way! “Vindication” is another great modern style song with La Torre in ridiculously good voice. “Redemption” just reeks of classic Queensryche, sounding every bit like an outtake (albeit a bit heavier) from the Rage For Order era. And man, is it great to hear Michael Wilton actually playing lead guitar again! The band pays homage to the Promised Land era with the dark and brooding, “A World Without,” which also features Pamela Moore on guest vocals (of Sister Mary fame). “Don’t Look Back” is another one of those songs that could have made its way to any of the band’s ‘80s releases, and even the song’s lyrics recall some of the bands finer moments. I should mention that thought-provoking and well-written lyrics are abound throughout this release—yet another long forgotten element in Queensryche music up to this year, including that other Queensryche album. The album ends with “Open Road,” a great ballad served up in the style of something like “I Will Remember” from Rage for Order. My only complaints are this: the album’s length (thirty-five minutes) by today’s standards is pretty weak. However, all things considered, this is a minor grievance due to the fact that the material is so strong and it leaves you wanting more in the best possible way. The deluxe edition features new, live tracks of some Queensryche classics, proving once again why La Torre is the only man for the job these days. But my other complaint has to do with mixing and mastering, which once again destroys the fidelity of an amazing record. The thing is brick walled (open any track in your digital audio workstation and look at the perfect peaks) and it sounds clipped and distorted all over the place. This is truly unacceptable, and we’re sick of mastering labs destroying good music so that you can hear them loudly through cheap ear buds. In November, a judge will rule which version of the band can use the name “Queensryche.” In my opinion, this is nothing more than a formality. It is glaringly obvious which version of this band is the real Queensryche. Classic “new” Sabbath for this century. I was not expecting much from this new Sabbath release, which is the band’s first album of original material with Ozzy Osbourne since 1978’s Never Say Die. In my mind, there was no way these guys could come up with anything that could even approach the masterworks of the band’s early ‘70s output, and I went into this listening session with that exact lofty expectation. Not only were my expectations met, they were exceeded in every way imaginable! This is not a “faked up” version of Sabbath, nor is it an attempt to modernize the band’s sound; this is quite simply a release that goes toe to toe with classics such as their self-titled debut, Paranoid, and Master of Reality. According to Ozzy and Geezer Butler, producer Rick Rubin sat the band down prior to recording and forced them to listen to their first album beginning to end. This turned out to be a genius move as the band obviously took this to heart and used said album as a blueprint of sorts for 13. For example, the eight minute opener “End Of The Beginning” is basically the song “Black Sabbath!” How fitting that a song that introduced us to the band back in 1970 serves in essence to “re-introduce” us to the band in 2013. The opening track sets the tone for what comes later—the classic Sabbath formula of sludgy riffs into a psychedelic jazz tempo change curve ball, Tony Iommi soloing, and Geezer Butler’s frenetic bass lines. The album’s first single, “God Is Dead,” is up next and, at almost nine minutes long, that was quite a ballsy move! Released back in April to mixed reviews, its slow and dirty delivery coupled with Ozzy’s decidedly low-key vocals threaten to drag things down into the mud. Truth be told, this is not one of my favorite tracks on the album. “Loner” restores the vibe with classic Sabbath riffing similar to “NIB,” and the album’s first “curve ball,” (the track “Zeitgeist”) recalls the brooding and psychedelic “Planet Caravan” from the Paranoid album. “Modern classic” is a term thrown around haphazardly, but it certainly applies to the track “Age Of Reason.” Anyone doubting my elation over this album needs to go straight to this song and then try to tell me I’m wrong! This track has it all—thunderous riffs, tempo changes, inspired soloing, and Ozzy’s best vocals in a long time. “Live Forever,” with its profound lyrics, is a short and punchy number and is a nice setup up for the two epic album closers, “Damaged Soul” and “Dear Father,” both clocking in at almost eight minutes in length. “Damaged Soul” employs an extended solo section similar to Cream or Hendrix before breaking into an up- tempo “freak-out” punctuated by Ozzy’s harmonica. “Dear Father” is classic Sabbath all the way, but its chorus recalls elements of Ozzy’s early solo career, almost Diary Of A Madman-esque. As great as this album is, there are a few grievances (there always are). First, original drummer Bill Ward is sadly missing here. Former Rage Against The Machine drummer Brad Wilk fills in nicely, but it would have been nice to have the original quartet intact. The other issue is the modern brick wall style mastering of the CD and digital download versions, which leaves the audio empty of any dynamics and, at times, audibly distorted. Luckily, for this review I also had the 180 Gram vinyl release on hand, which leaves dynamics fully intact and the instruments sounding more natural. Rock is dead they say? Never say die (pun intended), because not only did this album exceed the expectations of many, it actually spent time in the number one slot of the Billboard charts! Nothing shy of a triumphant comeback indeed. If you worship the hallowed Beatles ground, this is awesome stuff. 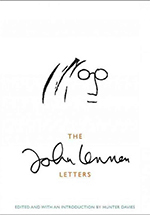 The John Lennon Letters is an amazing book that belongs on any finely stocked bookshelf. Beautifully printed, this nearly 400-page hardcover tome presents the most complete collection of correspondence written by John Lennon ever. Everything from letters to fans to notes on hotel receipts to doodles on paper are all here, presented both in their photographed original form as well as written out—much easier to read than some of Lennon’s scribbles. Editor Hunter Davies undertook the painstaking process of both acquiring copies of all of the content (from private collections as well as his own), and then sorting and arranging it all so that it follows Lennon’s life chronologically. This is, in many ways, the most personal biography of the genius songwriter ever written, and really, it’s mostly written by Lennon himself. The book is filled with rare photos and content you’ve never seen before. It’s a beautiful work that belongs in the hands of any true Beatles fan.